Which Bird Kite For You? Flying a bird kite is a very old idea. That doesn't stop Chinese kite makers and others from turning out endless variations! And things don't seem to have changed much since! The kite scene moves slower than hi-tech. Bird-like kites fall neatly into 2 categories. 2D (2-dimensional) and 3D (3-dimensional). 2D designs are more-or-less flat kites which have an outline resembling a bird. Hawks and eagles are popular, since they are soaring birds. An image of that bird is applied to the sail. This could be hand-painted in a remote village or the result of the latest material-printing technology in a factory. The main thing is, when in flight, there is no mistaking what it is supposed to be! 3D designs go a bit further to represent a living bird more accurately, by molding the shape of the head and body. Some examples even attempt to copy the flapping motion of the bird in flight! Interestingly, even some ancient Chinese kites fall into this rather clever category. 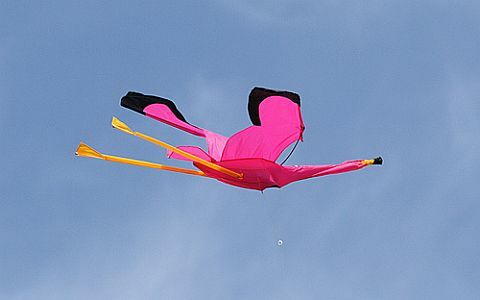 Designing kites to look like birds is an idea that pops up in many, if not most, kite-flying cultures. Even if it's just an image of a bird or bird's head on a large flat kite of some type. Ok, I guess that's a third category! The attraction is obvious. It looks like a bird, birds fly extremely well, so hopefully so does the kite. 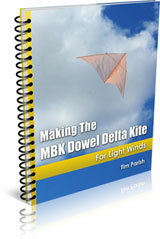 Making The MBK Dowel Delta Kite is a printable e-book. It's a PDF file download. This small island in Indonesia, just to the north-west of Australia, is home to a thriving artistic community. Wares from this location are widely available online. 2D and 3D kites of various birds are a popular choice for the artisans, who make them collapsible for transport. These are made in large numbers, and are also known as 'tourist kites' since most of them leave Bali in the cargo holds of commercial aircraft! The art-work is typically very vivid and colorful. Like many Chinese creature kites, the Balinese manage to achieve almost photo-realistic results with their hand-painted decoration. Parachute fabric is used to cover the bamboo frames for many of the tourist kites in Bali. Rayon or nylon from other sources is also used. Of course this is just one tiny category in the enormous range of traditional Chinese kite types. The outline of the head, wings and tail are constructed from thin strips of bamboo. These are expertly formed into the required curves to match the outline, and attached with glue. Next, the hand-painted sail is attached to the frame and trimmed where necessary. Finally, the bridle line(s) are attached to the frame. Unlike Western factory kites, many of these are made-to-order, and individually test-flown to ensure satisfaction. Most of these kites seem to be 2D, although with details such as the head and claws cleverly painted to look 3D from a distance. Dozens and sometimes hundreds of people at a time gather in one spot to fly kites, in many Chinese cities. In good weather, parks, reserves and other open spaces fill with people of all ages enjoying the relaxing hobby of flying single-liners. These are mainly aimed at children, and most are probably not great fliers by traditional standards. We've seen one of these occasionally, but not flying at any great height! No doubt some are better than others. If it flies at all, in a moderate breeze, the kite is probably doing a good job from a child's perspective! These kites typically use nylon spars and also nylon cloth for the sails. Sometimes Tyvek, another durable modern material, is used for the sails. Mass-production techniques are used for applying colors and patterns to the sails. Often, tails are required for stability, and these are designed to appeal visually to the kids as well. That pink thing in the photo is a somewhat comical example, which seems to be flying quite successfully without a long flowing tail. Would you like to make your own bird-like delta? Return to Paper Kites from Which Bird Kite For You?